Yesterday, Pioneer unveiled the WWS-DT101 Discussion Table [JP], which is essentially the company’s answer to Microsoft’s Surface – just bigger and better. 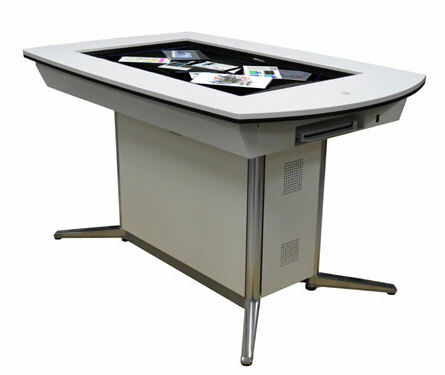 The main component here is the 52-inch multi-touch “interactive” LCD display with full HD resolution that supports up to 10 points of contact simultaneously. Pioneer says users can browse the web, view PDF, open MS Office documents, watch videos (WMV only) or view pictures on the display. The Discussion Table is sized at 1,600mm (W) × 902mm (H) ×1,000 mm (D) and weighs 160kg. Pioneer plans to start selling the best in Japan in July for about $37,000.